Going to the beach or just combing out your hair after a shower can be at times painful to others. I recently bought a new product called Coconut and Hibiscus Detangler from Shea Moisture. Which I took to the beach and my wife loved it. Since she has very curly hair she needs to be able to not let it dry with all the salt water in it. In this it will make it quit hair and breakable. Though the product is made for kids everyone can use this product with great success. It came in a large 12oz bottle and a sprayer attached to apply to the hair. It’s time to show those nagging curls their right place, it’s time for Shea Moisture’s Coconut & Hibiscus Kids Extra Moisturizing Detangler. This hair care product is nothing short of a magic potion that will bring bounce and life back in your child’s hair! An absolute must have hair moisturizer from Shea Moisture, this nourishing detangler contains certified organic Shea Butter, which is essential in keeping hair frizz-free and soft as silk. Slippery Elm Extract makes hair smooth to touch while Coconut Oil hydrates, and helps in defining curls. It also contains Hibiscus Flower Extracts to add luster and volume to hair, giving those kiddie curls extra bounce! 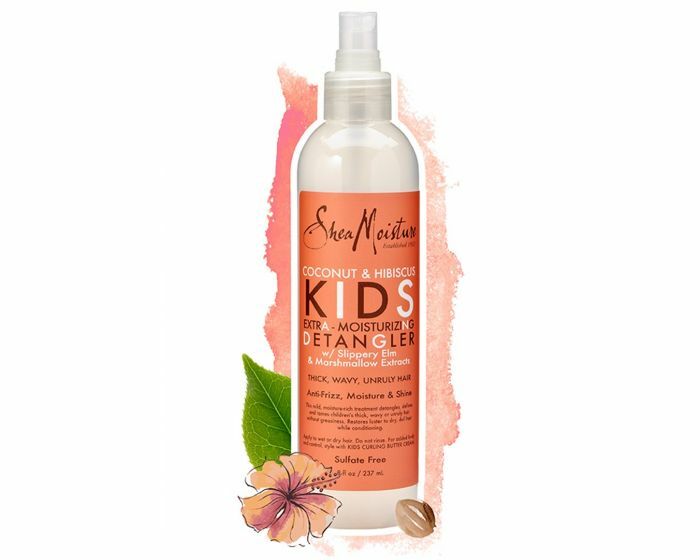 Shea Moisture’s Coconut & Hibiscus Kids Extra Moisturizing Detangler protects and moisturizes hair from roots to ends. Its natural ingredients make it completely safe for use by children of all age groups. Apply sparingly on wet or dry hair and watch as this product weaves its magic to transform your child’s wavy, curly hair to beautiful, frizz-free, glossy curls! Give it a try everyone its great and it is also good as a cutting solution.